“We try to leave zip codes better than we found them, though we haven’t left any zip codes,” says Schlafly Beer’s CEO James Pendegraft. It’s a motto the St. Louis brewery takes seriously, both at their brewpub and with their distributed products, vetting vendors along the way to make sure that their business isn’t sending a message they don’t agree with. 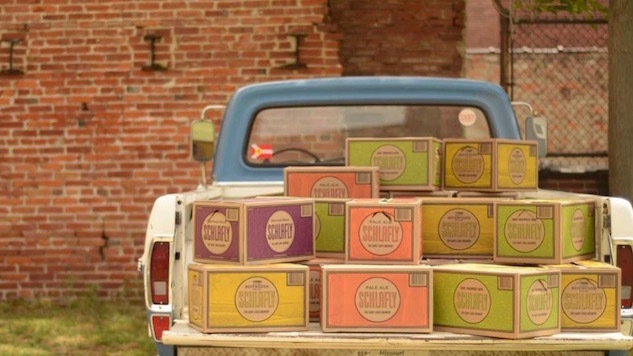 Schlafly has worked with their host cities of St. Louis and Maplewood, MO to improve municipal offerings, including a composting system in St. Louis and green energy power for their Maplewood production facility, trying to lead by example. As breweries grow national and the green movement grows, there’s a bit of contrast between making a brand’s mark and reaching customers. Schlafly recently released a new Hop Trial SMaSH Pack, highlighting four different single malt, single hop recipes, and will celebrate their twenty-fifth anniversary this December. Pendegraft talks about Schlafly’s new “100% Renewable Energy Stamp” and why they decided to include it, and what the industry can do to leave the planet in better shape. Paste: Why did you decide to use the renewable energy stamp on your packaging? Pendegraft: This is something that’s been in our DNA since the creation of the brewery. We started in a burned out building in a blighted neighborhood. We recognize we have a role in our communities so this was a way to heighten awareness and get more people involved. Being in the beer industry and located at the confluence of two of the largest water sources in North America, sustainability is pretty easy for us to do. We’re not importing water from other states and shipping it back out. It’s who we are and what we do. We thought by adding the stamp we could raise awareness and encourage others to follow in our footsteps. One of the things we’re really proud of is the city that we operate our largest production facility in, Maplewood, which is one of 56 communities in the United States that are recognized for green power. It was because Schlafly led that initiative and got local businesses to join us. We did that in 2012. Paste: Do you think brewing is on par with other industries, environmentally speaking? Pendegraft: I think we have the opportunity to move ahead. I don’t think we are ahead, there’s a lot of headroom. It starts off with how we look at transporting our liquids. I’m not trying to call anybody out, but I find it really bizarre for a brewery in California to import the water and just ship it back out. That doesn’t seem right to me. We’ve got a really small footprint. We’re in 12 states and that’s the extent of our distribution. We try to stay within 300 miles of St. Louis with a couple exceptions. We do take our beer to New York City but that’s something that we weigh very heavily. We don’t have a manifest destiny to go coast to coast. That’s expensive and has a big impact. We like the fact that there are lots of breweries that are local and we hope that they are mindful of the impact they have. I think the more consumers become aware of the impact on the environment, the more consumers are going to expect producers to act in a sustainable way. I encourage consumers and our employees to make choices and vote with their dollars for brands and organizations that support the causes you believe in. Paste: With initiatives like the stamp, it raises the topic of greenwashing, where some brands misrepresent for marketing purposes. Pendegraft: I was pretty suspect at the initial pass. This is something we’ve been doing for a while. The fact that it’s through a major entity, the power supply, gives it credibility. We have a lot of initiatives to reduce our power consumption. Some of it’s big and some of it’s really small. The small things, whether that’s changing out switches to sensors that shut the lights off, managing the furnace in our office space, ultra-efficient appliances and equipment, and questioning our vendors about their footprint and carbon management. For example, we source our glass from Pevely, Missouri. We pay twice as much as if we were to get it from Asia. We serve a role in championing local businesses and the second thing is we know the carbon footprint of producing something halfway around the world when I could get it down the street just doesn’t make environmental sense. Business sense, sure. We definitely see greenwashing. There is some value in raising awareness, but to trade on that is a different proposition. We see parallels to the GMO labeling in a lot of ways. We’ve been doing this all along. It’s a lot more than simply sticking something on the package to create awareness. It’s about having your employees have that in their DNA throughout the organization. Paste: Is greenwashing a real issue or just a marginal piece of the sustainability discussion? Pendegraft: I think there’s a responsibility for all organizations, but certainly all brewers should have truth in labels and to be transparent. If you’re going to make a claim, you need to be able to back that up. For our English Pale Ale we’re using English ingredients. We feel really good that it’s authentic. Our fruit and our pumpkin ale, we use real fruit and gourds. It’s across the spectrum. I think there’s potential for abuse and consumers need to hold companies accountable and companies need to be able to back up any claims they make. Paste: Where do you think brewing can improve the most? Pendegraft: First, we should hold ourselves and our own suppliers accountable to a greener ethos. That means trading with individuals or companies who support our ideals and are trying to advance it. It’s disingenuous for us to claim being a green organization and then turn around and buy our raw materials from people who don’t live in that same way. I give a lot of credit to some retailers who have pushed back and held their suppliers to a higher standard. Walmart, which is often painted in not the greenest view, has done a good job of doing that. Whole Foods says anything from our St. Louis brewery is acceptable because they know how we source. Beer is a very passionate and personal product for people, and as a brewery we have a following and we can use our voice to raise awareness on a lot of important issues.